The Smile has been shortlisted as one of only five finalists in each of the Commercial Pop-Ups and Temporary, Pavilions and Architecture +Wood categories at the Architizer A+ Awards 2017. 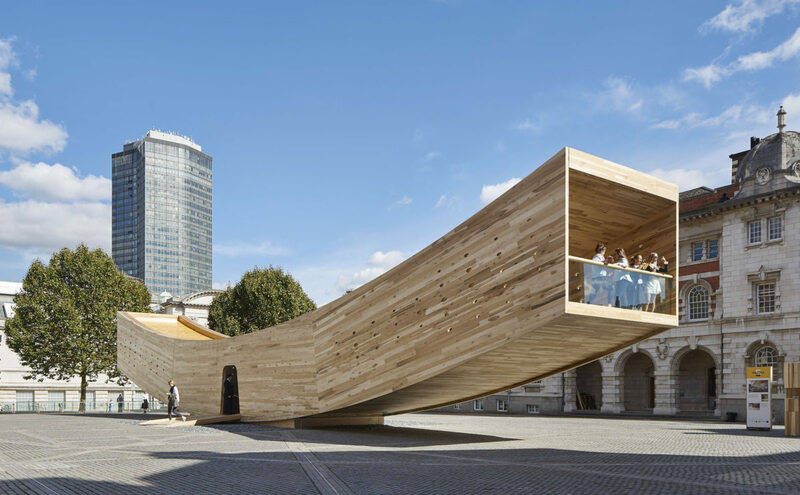 Called ‘The Smile’ due to its upward curving arc shape, the pavilion was a hugely successful landmark project for the 2016 London Design Festival. ABA collaborated with The American Hardwood Export Council (AHEC) and Arup to present the 136 m² tubular structure constructed entirely with cross–laminated American tulipwood. Arup’s Special Structures team in London described the project as ‘the most complex piece of CLT engineering in the world’. The Architizer A+Awards is the largest awards program focused on promoting and celebrating the year’s best architecture and products. Its mission is to nurture the appreciation of meaningful architecture in the world and champion its potential for a positive impact on everyday life. The shortlist of five finalists per category has been nominated by an international jury of industry leaders from architecture, technology, art, fashion and design fields. The winners will be chosen by a public vote, opening today, March 14, and will be announced April 11. The awards culminate in a red carpet gala celebration in New York in May. To vote in the Pop-Ups & Temporary category, click here. To vote in the Pavilions category, click here. To vote in the Architecture +Wood category, click here.